The Apple Watch is available in three different models: Sport, Watch (Basic), and Edition. In addition, there are two sizes to choose from for each model: 38mm and 42mm. The Sport is the least expensive model starting at $349 and final prices vary depending on the size and band style you choose. While the Watch or Basic model starts at $549 and can be as much as $1,099. All models have the same internals including 8GB of storage space, a Force Touch capable display, and mobile app support. The only difference between the models are the materials they are made of -- the Edition model case is solid gold -- and the bands they come bundled with. 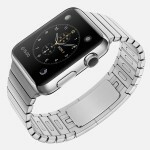 The Watch (Basic) has a stainless steel case, and Apple�s unique Sapphire Crystal protecting the display. The cheapest version comes with a �fluoroelastomer� (synthetic rubber) sports band. You can also choose from multiple stainless steel bands, but you'll pay a higher price, of course.